Question: We are thinking of moving to the Hampton Roads area of Virginia and are wondering where the public beaches are. 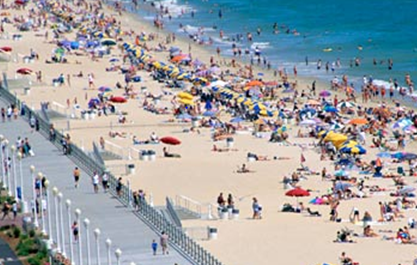 Answer: There are many beaches to choose from in Hampton Roads both in Va Beach, Norfolk, Yorktown, Newport News, Hampton, James City County, Gloucester and beyond in the The Outer Banks of North Carolina ( OBX) and the Eastern Shore of VA. This beautiful park has a large, shady and grassy Park area with picnic areas and a shelter. The swimming area and sandy beach are perfect for sunbathing, wading, sand castles and beach fun! The handicapped accessible Beach House, open seasonally, has a concession stand, restrooms and outdoor shower. You can rent the Picnic Shelter for group picnics. It is conveniently located near the volleyball court, restrooms, outdoor shower, concessions stand, beach and fishing pier. Rental fees: 1/2 day – $25(10 am to 3 pm) or full day: $50 (10 am to 9 pm). Call Parks, Recreation and Tourism Office for availability and to request a reservation form. Picnic areas located throughout the park include picnic tables and charcoal grills. There is no fee for these sites which are available on a first come first served basis. Near the Coleman Bridge — opposite Yorktown Beach. Swimming: Yes, but about half the water is restricted by the current. Lifeguards: No. Public restrooms: Yes. Other: Concession stand; two boat landings; saltwater fishing pier; free fishing. Where: Off Route 17 on the Gloucester side of the Coleman Bridge, next to the Virginia Institute of Marine Science. 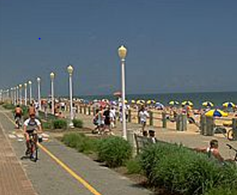 in Hampton you will find Buckroe Beach and with it’s mile-long Chesapeake Bay beach. Bordering the Chesapeake Bay, Buckroe Beach offers eight acres of family-friendly sandy beach, a playground for children, picnic shelters with tables and grills by reservation, a great walking and bike path, and spacious car park area. Certified lifeguards are on duty daily from Memorial Day through Labor Day. During the summer months, visitors can swing to the sounds of the Sunday night Groovin by the Bay concerts, or view an outdoor movie as part of the Tuesday night POMOCO Family Movie Series. Beach chair, umbrella, kayak and paddle boat rentals are available to make your stay at Buckroe Beach completely convenient and enjoyable. On-site parking is available for two hours for free; all-day parking in lots is available for $2. No dogs allowed on the beach from May 15-Sept. 15. Located near the intersection of Pembroke Avenue and Mallory Street in Hampton.Info: 757 850-5116. 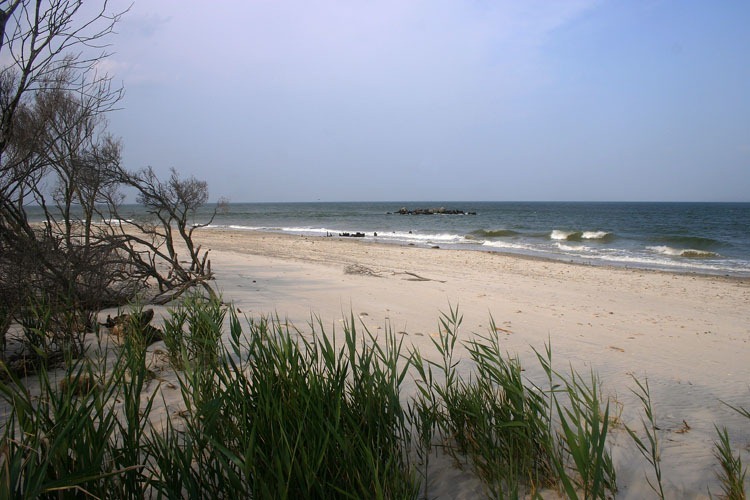 Also in Hampton is Grandview Nature Preserve a bit farther off the beaten path, but this two-mile stretch of beach along the Chesapeake Bay offers a secluded spot ideal for swimming and beachcombing. The nature trails that meander through some of the park’s 475 acres of salt marsh and tidal creek offer excellent bird watching. There are no lifeguards and parking is limited. 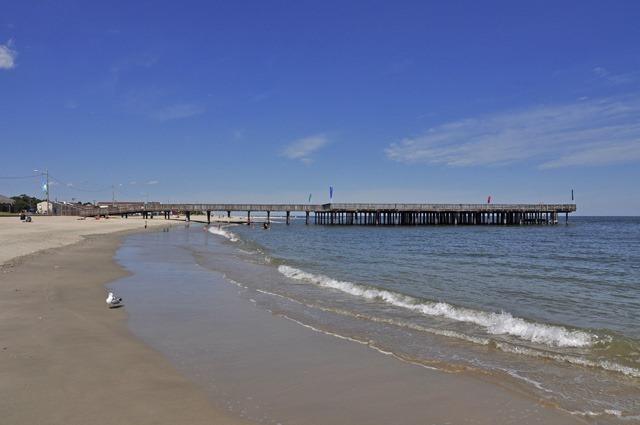 Newport News has Huntington Park, the city’s only public beach, located on the James River, nestled at the base of the James River Bridge at the intersection of Mercury and Warwick boulevards. The park has a giant wooden playground called Fort Fun, the longest fishing pier on the East Coast, a children’s fishing pier extending into Lake Biggins, a boat ramp and snack bar. The swimming area has lifeguards from Memorial Day weekend through Labor Day. King-Lincoln Park is a beautiful 18-acre park situated along the shore of the Hampton Harbor at the east end of Jefferson Avenue in Newport News.. The Park has a natural beach, basketball courts, playgrounds, a stage, three picnic shelters, restrooms, and tennis courts. Visit the King-Lincoln Park Interpretive Center to enjoy exhibits highlighting native wildlife and ecosystems along the harbor. King-Lincoln Park Interpretive Center is open weekends only Memorial Day through Labor Day. The Interpretive Center is also available (by reservation) throughout the week for groups requesting special interpretive programs. Each of the three picnic shelters in King-Lincoln Park will accommodate approximately 35 people. Each shelter has three to four picnic tables and one grill. Electricity is available at all shelters. The Ocean View beaches, along the Chesapeake Bay, are local favorites where the waves are gentle and the crowds manageable. The city maintains three beach parks, staffed by lifeguards in season, along the 7 1/2 miles of beaches off Ocean View Avenue. Ocean View Park, 100 W. Ocean View Ave., is home to a boardwalk and hosts a series of special events, including concerts, festivals and fireworks. There’s also Sarah Constant Beach Park, at the intersection of Tidewater Drive and Fourth View, and Community Beach Park, between Tidewater Drive and Chesapeake Boulevard. Norfolk’s beachfront also is home to the new Ocean View Fishing Pier, which juts 1,690 feet into the Bay and is open 24 hours a day, Memorial Day through Labor Day. The pier includes a restaurant, bait shop and game room. When someone mentions “the beach”, this is often the area that comes to mind. The Resort Strip stretches roughly from the Jetty at 1st Street to 40th Street in Virginia Beach. This is the “action-packed” area. Here the banner-towing airplanes fly, the oceanfront cafes cook, and the boardwalk bustles with activity. There are 25 parking lots and metered street parking all along the oceanfront. Visitors can surf, swim, bask in the sun and stroll the three-mile Boardwalk. Entertainment includes concerts at the 17th and 24th Street stages, a summer-long series of festivals and celebrations, and fireworks shows through July and August. The main resort area, from First to 40th streets, has lifeguards in season, with surfing allowed between Third and Fifth streets. The Oceanfront also has public restrooms, public and private parking and wooden walkways to the beach. The 3 mile long boardwalk stretches along the oceanfront from 3rd street to 40th Street. It is 28-feet wide and features a bike path to accommodate bicycles, surreys and skaters. 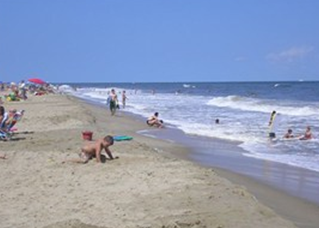 T he resort area of Va. Beach is likely the best known of the Virginia Beach beaches. This highly popular area has rigid regulations, however, because of the huge number of people that are packed into a relatively small strip of land. It is a HUGE tourist area. In fact, most the people you will find along the beach are not locals . Most locals prefer some of the smaller, out of the way beaches. Parking is premium for this beach. You’d better come early if you want to use one of the parking meters or even one of the several hundred available spots allotted by municipal parking lot. If you come after noon, chances are you will be out of luck unless you want to try one of the $10-a-day private lots; which are still somewhat limited. If you are looking for a safe, friendly, and clean beach, this is the place! The bay is calmer than the nearby oceanfront, so it’s a great place to take the kids! Parking can be tough, since it is a neighborhood beach, but on road parking is allowed, and they have a parking lot where you can pay to park for about $5.00. To get there from the oceanfront take Shore Drive in Virginia Beach, (drive north up Atlantic Avenue until it ends around 83rd Street), through the densely wooded area around First Landing State Park and you shall enter the wonderful world of “Chick’s Beach”. The beaches lie just over the Lesner Bridge on both sides, to the left and to the right. These are bay beaches, with calmer water. The beach to the left offers restrooms. There is a tremendous amount of power boat, Jet Ski and sailboat traffic on the bay. It is lovely. Just stay away from the bridge when swimming. There have been many drowning’s over the years due to the strong currents that run through that area. South of the resort area are Croatan Beach, Sandbridge Public Beach, and Little Island Park, all with lifeguards during season. Croatan Beach is almost hidden from the main drag of General Booth Boulevard. Extending from the rock jetty at Rudee Inlet to nearby Camp Pendleton, the beach provides an amazing mile of soft sand and raging surf. Tucked safely away behind a thick growth of trees and unusually beautiful homes, Croatan is a popular, sometimes VERY CROWDED spot for local surfers, families, and couples alike. open from 9:30 a.m. until 6:00 p.m. and has lifeguards on duty. Sandbridge Beach is similar in nature to the layout of the Outer Banks, with very few commercial businesses and beach houses and condos surrounding it that tourists can rent during the season. The beach is typically open during the season, which runs from Memorial Day through Labor Day. Hours during the week run from 10:00 a.m. until 4:00 p.m. and 10:00 a.m. until 6:00 p.m. on weekends and holidays. Lifeguards are on duty during those hours. Parking lots are located near the beach for typical vehicles, however RVs and buses are not allowed. The cost is $3 per weekday and $4 on weekends. Residents with a city sticker can park for $1 per day. To find Sandbridge, take General Booth Boulevard away from the resort area. Make a left onto Princess Anne Parkway at the Nimmo Church. (Historic, white church). Take another left onto Sandbridge Road. Next, make a left onto Sandfiddler Road. Ahead you will see the water tower, at Sandbridge. This 123-acre beach park was once the home to a Coast Guard Station. Today, Little Island Park features a 2,775 ft. beach and a 400 ft. fishing pier. You may also launch your canoe or kayak into Back Bay. Amenities include: Public Beach with Lifeguards (seasonal) Fishing Pier Surfing/Fishing Area Volleyball Courts Basketball Courts Tennis Courts (lighted) Playground Equipment Vending Machines Picnic Shelters Restrooms Showers/Foot Rinses Changing Area Diaper Changing Area Please note that there is a fee for parking and pier admission. North of 38th Street in Virginia Beach is where the locals hang. Here the beach is wider. It becomes downright “huge” the further north you go. The homes that scatter the shoreline are breathtaking! It is truly a lovely place. You need to know, however, that there are no public restrooms or public parking lots near this area of the beach. No one is permitted near or on the sea oats. (Don’t even think about it!). There are no lifeguards. To enjoy the North End beaches, one must get there early to secure a rare “on street” parking spot, pack a lunch or snack, and run the risk of dehydration by abstaining from liquids to avoid the need for a restroom. North End is popular with a wide variety of people who don’t like frequenting the larger, more commercial spots. It isn’t unusual to see this beach packed with families, children, and even senior citizens. Volleyball nets are available on a first-come, first-served basis. There are a number of them throughout the beach area. Dogs are not allowed on the beach and surfing is forbidden between Memorial Day and Labor Day. Free parking is available along either side of Atlantic Avenue. Parking is fairly easy to find during the week, but can be a bit of a problem on the weekends, so it is best to come early in order to find a spot. Please be courteous to the homeowners when parking. Do not block any driveways. An escape from endless strip malls, condominiums and resort hotels, First Landing State Park, is a surprisingly untouched area in north eastern Virginia Beach. It’s one of the few places you can really enjoy nature without all the city obstructions. It’s a large wooded marshy park with trails, campgrounds, beach accesses and picnic areas. I like to go along with my dogs (on leash) for hikes. The trees are covered in spanish moss and you feel like you are in an enchanted forest, far removed from Virginia Beach. The park is mostly flat so don’t expect the trails to be anything too rigorous. It’s a wonderful place to spend the day and you’ll never get tired of going. Many locals still refer to the park as "Seashore State Park." The name was changed in the 1990s to reflect the site’s historic significance as the first landing spot of the English settlers who eventually established Jamestown. There are basically two main sides to the park. There’s the beach side (turn into the left if you’re headed toward the Oceanfront on Shore Drive), featuring a beautiful undeveloped stretch of Chesapeake Bay front beach (thank God for state parks because that property would be worth billions). The other side of the park is the part (turn in to the right if you’re heading toward the Oceanfront) with the beautiful shaded trails that wind through prehistoric looking swamps filled with cypress trees dripping in Spanish moss. There are lots of foot trails and one main bike trail. The bike trail (which can also be used on foot) goes all the way through the park and connects to 64th Street down at the Oceanfront. At the end of 64th Street in Virginia Beach lies, “The Narrows”. You take a left off of Atlantic Avenue to get there, if you are heading North. You’ll see the First Landing State Park entrance at the end. You may be stopped by a Park Ranger upon entering. He may ask for a nominal fee. There is a boat ramp, beach and fishing area that abut Broad Bay. This is one of the loveliest sights in Virginia Beach! Broad Bay is just that – “broad”. It is breathtakingly beautiful! There is lots of boat traffic, which creates an ever-changing and entertaining view. Biking and hiking trails add to the versatility of this great area! We have taken our kids crabbing and jet skiing back there many times. In The Williamsburg area has James City County’s Jamestown Beach Park, located at 2205 Jamestown Road across from Jamestown Settlement. The park features a newly restored beach front, completed through a $100,000 Living Shoreline grant from the Chesapeake Bay Trust. 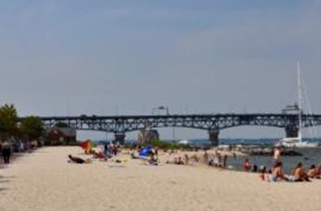 Yorktown Beach, located near the George P. Coleman Bridge and the heart of historic Yorktown, is a quiet little beach that is perfect for swimming, windsurfing, surfing, and boating. Although not all tourists are aware of this little gem of a spot, the locals certainly are and that is predominantly what you will find here. 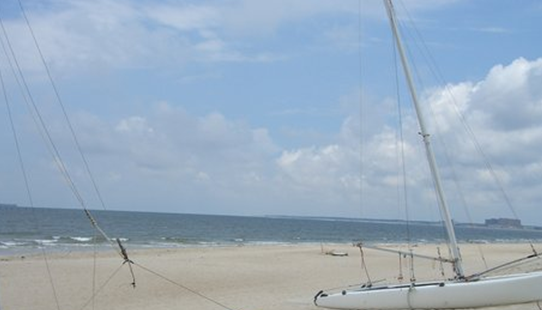 Although this beach doesn’t have the amenities of some of the larger ones located in the Virginia Beach area, you will definitely enjoy the view. The way the water meets the beautiful shoreline is a sight worth seeing all on its own. For surfcasters, there is more than 100 miles of accessible beach, and there are several piers along a stretch of the coast from Kitty Hawk to Hatteras. Hot spots for surfing include the areas around Cape Hatteras Lighthouse, the S-turns in Rodanthe and First Street in Kill Devil Hills. For a different kind of beach experience, there’s Jockey’s Ridge State Park, where visitors can climb the largest "living" sand dunes on the East Coast, fly kites and even take hang-gliding lessons. 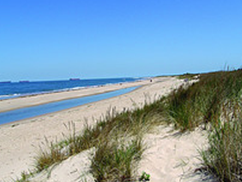 Other areas Pea Island National Wildlife Refuge includes 13 miles of quiet beaches. Cape Hatteras National Seashore offers striking and pristine scenery with a wide array of amenities for visitors. There’s also Coquina Beach, home to the scattered remnants of the shipwrecked Laura Barnes. Just across Hatteras Inlet, and reachable via a free ferry, is Ocracoke Island, a picturesque town with a beach that regularly makes national "best beach" lists. At the far northern end of the Outer Banks are beaches accessible only by four-wheel-drive vehicles, from Corolla north to the Virginia state line. Those who want to explore this less accessible beachfront without climbing behind the wheel can also find guided tours offered by several local businesses. On the EASTERN SHORE of Virginia you will find the Cape Charles Town Beach, at the end of Mason Avenue, it offers a shallow, protected swimming area in the charming resort town of Cape Charles. There are restrooms and a fishing pier at the southern end of the half-mile-long beach and restaurants within walking distance. Summer concerts, holiday events and a monthly Applaud the Sun beach party take place in and around the beach’s pavilion. Parking is free along Bay Avenue, with a paved walkway running the length of the beach. There are three wooden walkovers providing handicapped access. No lifeguards. Pets are prohibited on the beach Memorial Day through Labor Day. Also on the Eastern Shore is Kiptopeke State Park just three miles north of the Chesapeake Bay Bridge-Tunnel, but worlds away from the hubbub of busier resort areas. Sunken concrete-filled ships form a protected area for swimming on the half-mile beach. Lifeguards are on duty Memorial Day through Labor Day. Pets are not allowed. Assateague Island has extensive beaches. 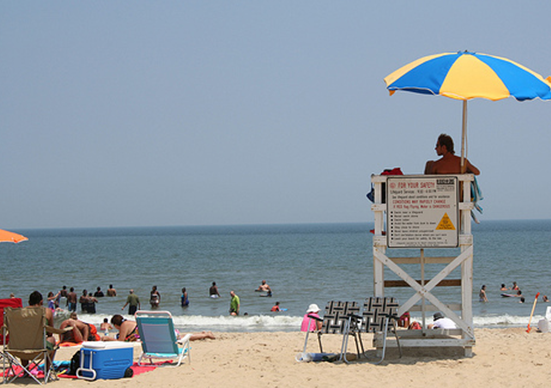 Lifeguards are on duty from Memorial Day through Labor Day at Toms Cove Beach. Pets are not allowed. Hours vary by season; entry fee is $10 per vehicle, good for a week; for those who enter on foot or by bike, admission is free. If you want a tranquil and well preserved beach that is free of noise, trash and boardwalks then you have found your paradise here in Assateague and Chincoteague! 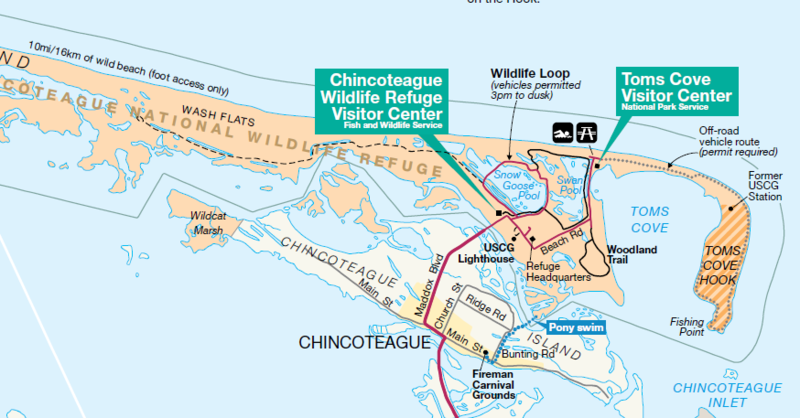 Plus enroute to Tom’s Cove you hopefully get a great view of the famous Chincoteague ponies within a quarter mile of the road – make sure to go slow to see these wild beauties! Also make sure to take PLENTY of bug spray as depending on the day you may get many mosquitos if you stop to get out and take pictures of the pretty ponies. This is a very family friendly beach and very laid back. Bring your own food as there are no arcades or boardwalks with takeaway food. Last if you are lucky like us you will see pods of dolphins doing back flips! The Cape Henry Inn and Beach Club at Fort Story in VA Beach boasts a spectacular beach that is open to all registered guests. The Cape Henry Inn and Beach Club has two outdoor swimming pools. Both pools are open from mid May to mid September (weather permitting). The pool cabana is located at the main Inn pool. Serving refreshing drinks, burgers, and light snacks, the Pool Cabana is open from Memorial Day weekend to Labor Day weekend (weather permitting). The beachside Sand Bar at the end of the boardwalk overlooks the Chesapeake Bay and serves refreshing drinks, burgers, and light snacks. Open Memorial Day weekend to Labor Day weekend (weather permitting). Although you have to be military to gain access to Dam Neck Beach, it is located just 3.3 miles south-southeast of the tourist-trap and crowded Virginia Beach boardwalk. The Dam Neck Beach is well-guarded during the summer swimming season. Beach volleyball and shower/bathhouse available. Navy Lodge, RV park, and 3-bedroom cottages available on the beach as well via MWR. Great beach that is not too crowded!